Breakers North was fantastic. A great location. A huge apartment with wonderful views. We will definitely be back. Our third stay at Breakers North. Would certainly stay again! Spacious with friendly staff. Good location. We had a great stay and will be back. Thank you! Had a lovely Easter break. We live and travelled from country NSW. Have stayed at Breakers North many times, previously with young sons and had beach front/ocean view every time. This time just mum and dad, booked single room but did not realize that we could not get that same ocean view. My fault. We had a fantastic time. Could not have asked for a better location. Great View. When they say right on the beach - they mean it. Love this place. Great location. Good value. Good parking. AC struggled a bit in 37 degree heat. No big problem. Nice furnishings. We will be back. Perfect location, very clean and spacious rooms, very friendly and helpful staff. Had a wonderful stay, so much so we have just booked another holiday with Breakers North. If the only complaint is your room could do with a new lounge you are on a winner! Great facilities, great location, if you need somewhere to stay make it here. Very relaxing and enjoyable. Loved being so close to the ocean. The pool and bbq area are so well maintained. We couldn't have asked for better, thank you. Amazing time, perfect location, totally comfortable and all a family needs to have a thoroughly enjoyable holiday. Thanks for everything! What a perfect location for a relaxing break. Views, facilities, cleanliness, perfect for friends, couples or families. Had a great stay. Room had everything we needed. Location on the beach is sensational. Have stayed here before and will so again. Staff friendly and efficient. Thanks for a great holiday. ideal for mature couple who like to walk the beach and the loungers over-looking the beach were in a great spot ! Breakers North was in a perfect location for our family as we had direct access to the beach with life guard patrol and local caf� and stores with in walking distance. We didn't have much interaction staff but they were helpful and pleasant. Our apartment was clean, very well laid out and spacious for the three of us. The only noise was from the ocean. Thank you we will be back again to stay. Very quite area on the beach great for our family. Pool area was clean and user friendly. Staff very helpful and friendly. we have a very good stay! Had a lovely apartment with every convenience close at hand. Will definitely use this property again. Beautiful apartment easy to feel at home in. Totally superb. I can't wait to stay there again. Regards Karen. Fantastic weekend away with the girls. I requested a balcony beach view and the room was perfect, view was absolutely amazing. Very clean and comfortable very close to shops. Nice walk to surfers and broadbeach. Apartment was very safe and secure. Nice pool and spa although we had to give the spa a miss as there were too many kids in there each time. I look forward to going back soon again. went down for weekend and loved our break. 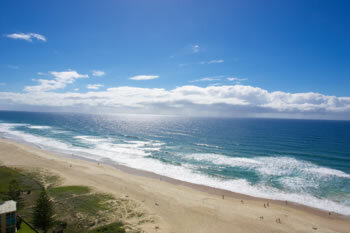 Great place to stay near Surfers Paradise, beautiful access to the beach. Overall the Apartment was reasonably comfortable, however, maintenance seems to be an issue, ceiling fan in bedroom did not work, there were at least six light globes that did not work, fridge freezer needed a defrost and door catches to the balcony do not work, window drapes do not fit and looked terrible, window curtains also had mildew on them. Overall it looks a little tired. I must say everything mentioned above aside, it was found overall to be very clean.